Let’s face it – most of our family history binders need a little bit of help when it comes to eye-appeal. But who has time for that, right? Our research binders are a result of months, if not years’ worth of hard work and now I want you to think about how they look? Well, let’s look at it from the opposite angle; we have to do something in order to draw the elusive family member into our stories. Plunking our tomes of family history research into their laps and expecting our loved-ones to want to read them might be asking a bit too much. Or haven’t you experienced the eye-roll when you have tried to do just that? Maybe I’m over-exaggerating a bit much — but then again, maybe not… What draws you into reading a magazine? The cover most certainly. And once you have started to look at a magazine, it had better have some pictures as well to break up the stories, am I right? You know I am. Let’s make just a few easy changes and see if you don’t love your binder even more! I am suggesting that we change up the title page, add some pictures in a beautiful way and make-over those ugly tabs that we are so used to seeing! It’s not that hard and I, for one, am more than willing to try something so easy if one or more of my family members might be tempted to open up their own family history. It’s really pretty easy. 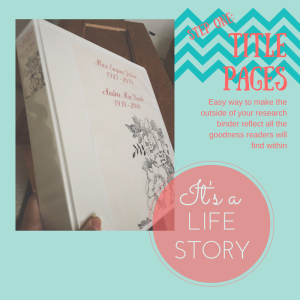 Over the next couple of weeks, I’ll be breaking this down into those three DIY parts: 1) title page make-over, 2) adding photo pages with stories or at least captions and some comments, and 3) a major tab re-do that will instantly change the feel of your binder. And to help with the Title Page Make-over, I have decided that a video might work best. Before you check it out, you will need to install Picasa, a free photo editor/management program. We are going to use it kind of like design software. Picasa is easy to set up and you can get it Here. This easy to use software can scan your computer to add all your photos and you can also use the folder manager (in Tools) to decide which folders to continuously monitor. I have been using Picasa for years and it is my go-to photo archive manager as well as a quick editor. For my purposes this time, I’m using it as a design program on a very simple level. Of course, you could purchase Photoshop Elements or even Photoshop, but for my purposes with these changes, Picasa fits the bill. This week we are making changes just with the title pages. If you are interested in purchasing the same digital papers that I am showing, here is the link to Becky Higgins Project Life Heritage Kit. Go to Tools and choose Options. Then click on File Types and click on all the formats available. Click on OK and you should be good to go! If you don’t do this little step, you might not see all the beautiful papers that you just downloaded . Now that you have the house-keeping all done, give it a try! I would love to see what you come up with for a title page. One more reminder: You aren’t making this only to please yourself; remember the goal. Wouldn’t we all love to lure our younger family members into looking at their family history and taking an interest? For inspiration, you might look around at Pinterest or Instagram to see what is catching their eyes! Over the next two weeks, I will be posting new videos and/or tutorials on how you can spruce up your own family history research binder. I hope you give the ideas a try and please let me know about your success stories!